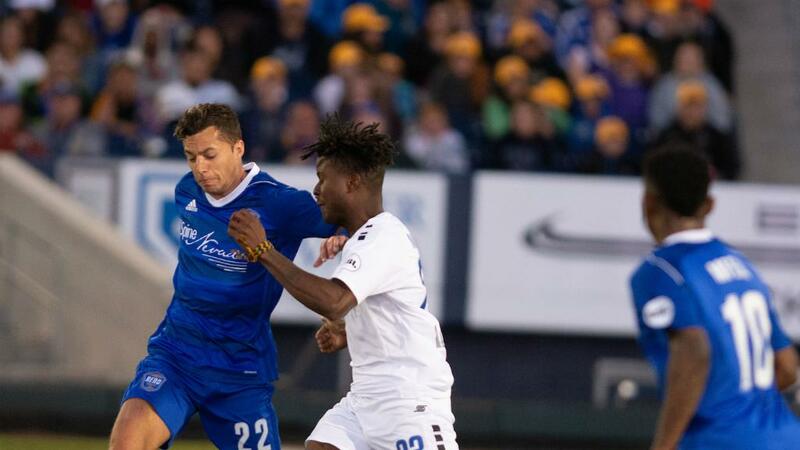 RENO, Nev. – Colorado Springs Switchbacks FC was much too strong for Reno 1868 FC at it overpowered the Nevada club in a 4-0 win at Greater Nevada Field on Saturday night. There were bad signs early for Reno as the hosts conceded an own goal in the 18th minute when Luis Felipe Fernandes’ attempted clearance looped high over his goalkeeper and into the back of the net. Colorado Springs doubled its lead in the 25th minute as forward AJ Ajeakwa managed to nod home a perfect cross from midfielder Luke Vercollone. Late in the half the Switchbacks nearly had a third as midfielder Jordan Burt got a shot away but hit the crossbar, forcing them to settle for a two-goal lead at the break. The Switchbacks didn’t let up and started the second half with a goal as Vercollone was afforded too much space on the edge of the penalty area which allowed him to place a powerful shot into the left corner of the net. A corner saw the Switchbacks well and truly wrap things up as Josh Suggs swung the ball in for defender Jamal Jack to leap highest and head home the goal. Reno 1868 FC thought it had a consolation goal in the 85th minute when Mohamed Thiaw put the ball in the back of the net but was denied by the offside flag after slightly mistiming his run. Things got even worse for Reno with two minutes to play as defender Brenton Griffiths was shown a straight red card for a scuffle after a foul, but Reno was not further punished on the scoreboard as the Switchbacks swept away with the victory. 1. With only draws in the prior two meetings something had to give, and unfortunately for Reno, its poor form to start the new season opened the door wide for Colorado Springs. The Switchbacks came in off a victory, determined to get their form going and the Switchbacks clicked, scoring four goals, three in open play, more open play goals than they had scored all season. 2. The own goal from Fernandes was the second scored by Reno 1868 FC following Matt Lewis’ own goal in the club's season opener. That worrying trend has Reno on top of the league for own goals, giving Head Coach Ian Russell plenty to think about, especially following Griffiths' red card which will force a change in defense. 3. The Switchbacks were determined to make it hard for Reno to get going, routinely breaking up play from 1868 FC with 16 interceptions. The Switchbacks came into the match fourth in the league in interceptions, having made 85 so far this season, something that has been developing well as the season has gone on. Luke Vercollone, Colorado Springs Switchbacks FC – Involved with two goals, providing an assist on one and scoring with another, Vercollone was vital to the Switchbacks offense with an 83.3 percent passing accuracy helping to tear up the Reno defense.